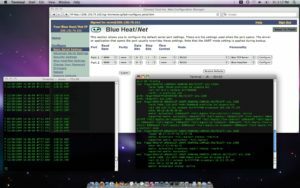 kdb318: How to use a BlueHeat/Net on a Mac - Connect Tech Inc.
Below are two examples of how to interface the Blue Heat/Net Ethernet-to-serial device to a Mac laptop or PC. Once the Blue Heat/Net unit is configured for Raw TCP Server, it should be accessible from the Mac by its IP address and port number. In the above example, a telnet session has been opened on the IP/port of the Blue Heat/Net Raw TCP Server serial port. The data seen on the terminal is data being streamed into the port on the Blue Heat/Net. Parallels is a virtual machine software package for Mac that allows you to run Windows on a mac. Using the Parallels software, you can successfully install, configure and use a Blue Heat/Net on a Mac using Windows virtual serial ports. Once the Windows operating system is successfully installed and running on the Mac via parallels virtualization software, download and install the Blue Heat/Net Windows host driver from its product page. Once installed, the driver will be able to discover the Blue Heat/Net unit connected directly to your PC or on your network. In order for the driver to correctly discover the Blue Heat/Net, ensure that the Parallels network settings are set up to bridge the ethernet connection that is connected to the same network that your BlueHeat/Net is on. It may be the case where your BHN is on a LAN wired network and Parallels will default to bridge a wireless connection, so please be aware of this and adjust the settings accordingly. (see screenshot below).